Don’t make a sound. That’s the goal in Stifled, where the new approach on horror actually takes the sound you as a player make and translates it into the game. The catch is that the dark environments are only revealed through echolocation, so it may be required to send out some sound waves to see the path forward. Risk a shout to illuminate the entire area? Or send out a series of tiny chitters that provide limited vision, but don’t attract the attention of the things that go bump in the night? Grabbing a mic and using your voice as another layer of control is the idea that Stifled was built on. The horror genre has proved hard to innovate on since developers have been taking away our ability to fight. Stifled adds a new layer that focuses on sound over visuals, opting instead for simple outlines that resemble portrayals of a bat’s echolocation. Don’t worry if you don’t have a mic though (even though every PS4 shipped with one). The X button can be used to send out an audio pulse, but using the DualShock 4 for this audio control is far less immersive than actually making sounds with your own mouth. In fact, there are a total of four variations that Stifled can be played in, each one changing the kind of experience that players can have. VR and mic audio are optional elements, so the game can be played in any configuration, from no-VR and no mic—the least immersive method—to using the virtual reality headset and mic for audio pulses—the most immersive of the four. Flexibility then becomes both a strength and weakness of Stifled. 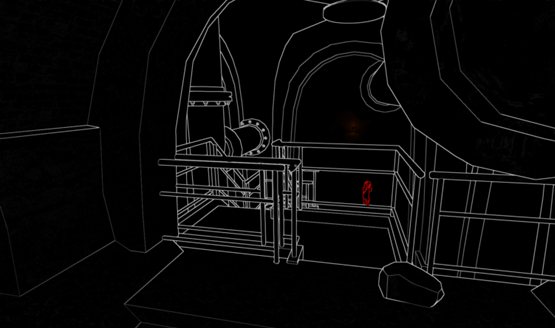 As a VR game with a unique audio input mechanic, Stifled is a much stronger experience. Without those elements however, the potential ends up stifled. At the very least, if you don’t have a VR headset, make the most of Stifled’s mic input in order to engage with the environment in a unique way, and you’ll be rewarded for it, even if that reward doesn’t come in terms of narrative payoff. Stifled faces a disconnect between its main mechanic and the story. When I awoke at the beginning of the game in a fully modeled and lit house, using my voice to drive away the fog around me, I expected to soon learn of some kind of Daredevil-like accident that would take my eyesight and necessitate the game’s creepy echolocation mechanic. Instead there’s a constant shift back and forth between rendered environments and those that are seen as nothing more than white outlines. Games like Outlast introduce their mechanic through story early on (journalist using nightvision on a camera), which makes Stifled feel more like a disconnected gimmick throughout the game. That’s not to say the gimmick is bad, but it certainly takes on the role of a separate element rather than a layer of fear enforced by the narrative. I started off by calling out softly at each juncture. The path from the forest to the sewers didn’t have anything frightening along its length, but it’s that unknown that’s truly frightening. 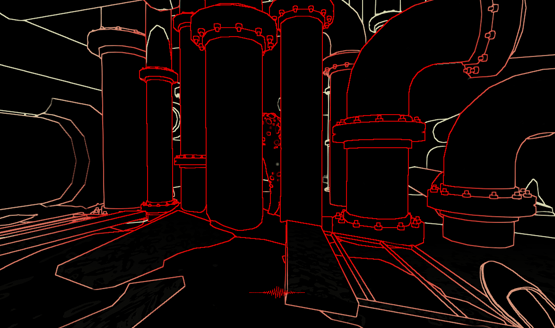 Deeper in the sewers I was met with red lines instead of white. Clearly whatever was making those sounds was not friendly, but for now, it appeared to be on the other side of a set of pipes. Catching a glimpse of a monster in a traditional horror game can be terrifying. Catching a glimpse of a monster using audio pulses from your own mouth that is clearly drawing it to your location is another experience entirely. I tried to quietly creep through the ankle deep water without making a sound, but the sloshing was drawing the creature parallel to me. In VR, it was truly unsettling. It wasn’t just following my character. It was following me. Pretty soon I got used to how I had to navigate, either by throwing stones or softly calling out to check the area, moving forward in small bursts. Instead of remaining scary, the mechanic got played out. It’s a problem that so many horror games fall into. By the end, the tension and terror gives way to the ability to learn and exploit the system. Instead of being scared of the creatures that were out to get me, I got scared of the bad checkpoints and whether the AI would allow me to get past the next part. Trying to track creatures that are invisible unless you make a sound and are inherently attracted to those sounds means that navigating narrow paths becomes a test of patience. By the fourth, fifth, and tenth times getting attacked in the caves, I wasn’t scared. I was frustrated. That’s not a feeling a game should be giving off. Still, Gattai Games explores something unique with their alternate input. Using voice as a method of both control and inviting danger was fascinating to explore—even if I couldn’t figure out anything more interesting to say than “hello hello hello hello hello” while trying to see the environment and move forward. The exploration of sound as visuals is an exciting element, even if some of the execution in Stifled comes across as disconnected or frustrating. For that, I give Gattai Games bonus points. 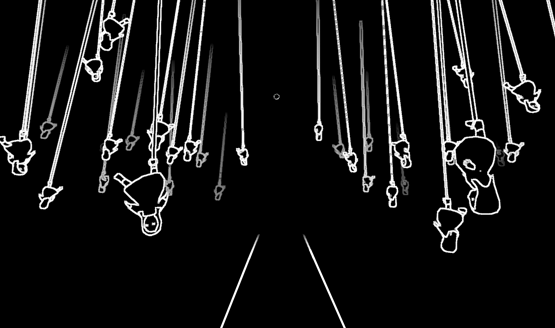 Stifled explores outside the box of traditional horror experiences. Stifled is an exercise in taking a great idea and applying it to a worn out genre. The indie horror tropes bleed through, despite a unique initial premise. Mumbling under my breath to be able to see barely plays into the narrative, and no scare ever got me to scream out loud, so it didn’t quite have the intended effect, seeming more like a gimmick by the end. The tired horror ideas became quickly obvious when VR and mic audio are not used. Gimmicks are the only legs that Stifled has to stand on, and when the novelty of them wears out, there’s only a tried and dull horror experience underneath. Stifled review copy provided by publisher. Version 1.0 reviewed on a standard PS4 and PSVR. For more information on review scores, please read our Review Policy.